This costume jewelry shamrock necklace features gold tone accenting along with green enamel leaves. This shamrock necklace is an Irish costume jewelry design that is enhanced with green enamel accenting along with gold tone metal. 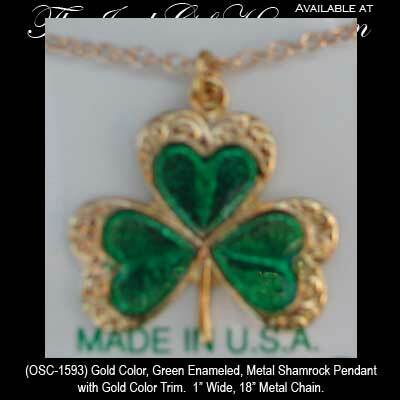 The shamrock pendant measures 1" wide and includes an 18" long gold tone metal chain. The Irish costume jewelry necklace is made in the United States and is received with a shamrock history card, complements of The Irish Gift House.